A view from the MESSENGER spacecraft's Narrow Angle Camera (NAC) on Jan. 16, 2008. One scientist thinks mantle rock pushing up on Mercury's crust formed lobate scarps seen in this image across the planet's surface. 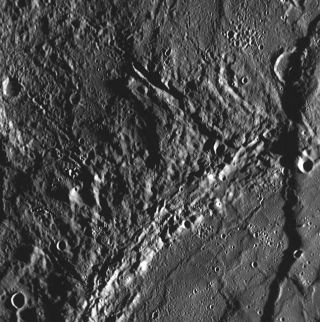 Mercury'ssurface is not only peppered with impact craters, but also wrinkled withmysterious chains of cliffs. Scientiststhink the "lobate scarp" cliffs — some 2 miles (3.2 kilometers) highand hundreds of miles long — were created as Mercury's crust bunched up aroundits shrinking interior, something like a dried-out piece of fruit. A newtheory, however, suggests that rising sheets of hot mantle rock popped out theplanet's characteristic ridges, helping to create the cliffs. "There'sa preferred north-south alignment to these scarps," Scott King, aplanetary geophysicist at Virginia Tech University, told SPACE.com. "If you just have a shrinking sphere, there's no reason they should bealigned. It should be fairly random." Instead ofjust a shrinking crust, King thinks linear sheets of rock heaved on theplanet's crust from below, pushing up the cliff-like features. He detailed hiscomputer-modeled hypothesis in the March 16 online edition of the journal NatureGeoscience. "It'sa very plausible idea," said Sean Solomon, principal investigator forNASA's MESSENGER spacecraft at the Carnegie Institution of Washington, who wasnot involved in the study. "It gives a nice set of predictions about whatwe might see, so it's highly testable." Prior toMESSENGER's January 2008 flyby of Mercury, Mariner 10 was the planet's mostrecent visitor — but that was 33 years ago. Mariner 10captured only half the surface of the solar system's innermost planet, Kingsaid, preventing a final verdict on whether or not the cliffs have anorientation across the planet. That scenario improved dramatically with newMESSENGER data. "Wesaw a third of the part we had never seen after this recent flyby," Kingsaid, noting that the new views also had different sun angles to highlight newcliff regions. "It still looks like the idea of an orientation is going tohold up." King saidthat after the MESSENGER (which stands for MErcurySurface, Space ENvironment, GEochemistry and Ranging) spacecraft reachesstationary orbit around the planet in March 2011, scientists will know forcertain if the scarps are aligned planet-wide. "Untilthen, we won't have 100 percent coverage," King said. For now, the craftis zooming near Venus's orbit and is closing in on Mercury for a second pass inOctober 2008 and a third in September 2009. Assumingthe scarps are indeed lined up, King thinks a thin yet active mantle layerbeneath Mercury's crust may be to blame for the cliff-like features. "It hasa very large iron core compared to Earth, Venus and Mars," King said ofMercury's metallic heart. "The rock above it is confined to a real thinshell." Becausethere's hardly any room for hot mantle rock to snake toward the planet'ssurface, King's models suggest that the material is forced into a rolling pattern oflinear or sheet-like plumes. On Earth — where mantle space aboundsbeneath the crust — rising rock is mostly squeezed into cylindrical plumes. "Thedynamics are much different for Mercury. I've done a number of models, and thisroll pattern almost always shows up," King said. "The stressescreated by that on the crust can be enormous." Althoughboth King and Solomon agree that Mercury's cliffs probably stopped forming afew billion years ago, King's models suggest that convection activity mightstill be roiling beneath the planet's surface. "Youbottle up a lot of energy when you create a planet, and it takes a long timefor that heat to get out of the system," King said. "It's stilldebatable whether or not that convection continues on today." Solomonsaid instruments on MESSENGER that can monitor changes in mass should be ableto tell if hot rock is still moving beneath Mercury's cold, hardened shell. "Ifnew images show an orientation to the lobate scarps, Scott [King] may havedescribed convection of Mercury's mantle in the past," Solomon said. "If that convection is still going on today, we should be able to useMESSENGER to detect that activity in the planet's gravity field and topography."